To plagiarize, I have held six  opposing ideas before breakfast. The feeling I got when I read those words were really funny. It’s like feeling that’s something’s not quite right, something is bothering me and I literally had to laugh all the whilst I was reading as reading with contradicting feelings made it so uncontrollably funny! I guess this is really a perfect example for cognitive dissonance! what would happen if the person kept repeating “cvstobvs”, hopefully ,sufficient bvs’s wouldmake it worthwhile. 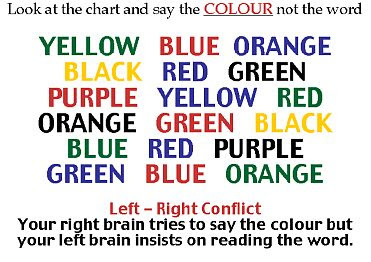 I think I physically felt my brain complain as it tried to reconcile the incongruity between the word and the colour!